"South Padre Island Volleyball is a group of beach volleyball enthusiasts who play and promote the sport fronting Boomerang Billy's Beach Bar. 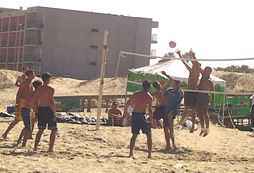 We organize monthly beach volleyball tournaments throughout the summer and into the fall. Two of the tournaments are sponsored by the SPI-Convention and Visitors Bureau. These two events being the Memorial Day and Labor Day Weekend tournaments. Great new site provides updated info on what is happening on SPI in the following categories: Night Clubs/Bars; Adult Night Life; Sports; Performing arts & Family Entertainment; Restaurants and Special Events. This site provides a showcase for Valley Football Players who have excelled both academically and athletically; a one stop resource for Valley Football News, and provides college recruiters a free source of information on up and coming players from the Valley. Check out our player showcase! South Padre Island's water park is a big hit with visitors and residents alike! Fully-equipped health club featuring free weights and machines, treadmills, recumbant bikes, steam and sauna rooms, tennis, basketball and racquetball courts. Windsurfer rentals and instruction... Jibber will deliver and set up your rig anywhere on the island. Kayak and bicycle rentals as well. Have you ever gone to the beach and seen what looks like a parachute towing a person on a surfboard and wondered, "What is that?" Well, it's called Kiteboarding or Kitesurfing. Check out our website to find out how you can learn this new extreme sport safely, quickly, and cost effectly. in Port Isabel is home to 51 slips, 22 RV slots, a yacht harbor rental house, and a fleet of rental boats and charter yachts for pleasure cruises. We'll also be operating out of several docks on the Island this summer doing weekday and evening cruises on high end luxury yachts for small groups. Build a better sand castle! Private sandcastling instruction from the Sons of the Beach Sandcastle Wizards.